GET YOUR RESEARCH FUNDED - AOS has distributed over $5.6 million to date! If you would like to submit a grant for consideration of funding in 2020-2021, a LETTER OF INTENT and BIOSKETCH, including details regarding other existing support, must be submitted by November 1st of the year prior to funding. The next funding cycle begins July 1, 2020. The letter of intent must state the desired grant mechanism for the proposal (CSA, Fellowship grant, Research Grant), the Principal Investigator and Institution(s), a working title and abstract and include Specific Aims and a proposal summary (2 page limit on abstract and aims). Complete applications will be invited from selected applicants based on the Research Advisory Board's review of the letters of intent. Applicants will be notified whether they are invited to submit a full application the first week of December. Completed applications must be received by January 31st. 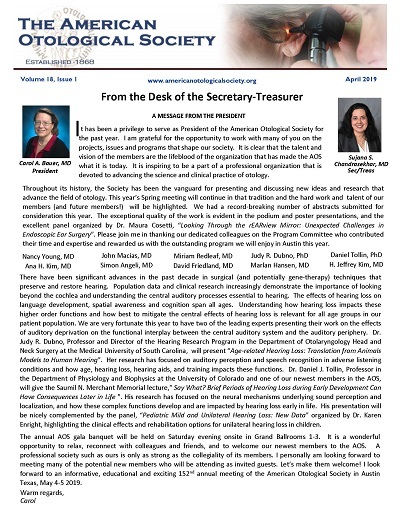 John S. Oghalai, MD, Executive Secretary, Research Fund of the American Otological Society, Inc.
NEW! Please read instructions thoroughly, there are NO FORMS to fill out. Click here to download and view "Fast facts about AOS Grants"
The Research Advisory Board (RAB) is comprised of seven AOS members, each serving a 7-year term and three consultants, each serving a 5-year term. These individuals are among the the most highly respected researchers in our field. The expertise and dedication of the RAB are critical to the success of the mission of the AOS Research Foundation. Research Fund of the American Otological Society, Inc.